This is the story of the quest for Captain Grant of the Britannia, who has been shipwrecked at sea. Captain Grant sends a note in a bottle requesting help and rescue. The bottle contains the same rescue note written in three different languages, but the water has destroyed most of the words and only clues remain as to his whereabouts. The bottle is discovered by Lord and Lady Glenarvan of Scotland, who put an advertisement in the newspaper hoping to contact any of Grant's survivors in Scotland. Mary and Robert, Captain Grant's children, respond to the notice and have high hopes that their father may yet be found. Lord and Lady Glenarvan decide to launch a rescue expedition. 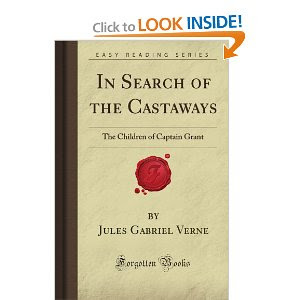 Lord Glenarvan makes it his personal quest to locate Grant and together with his wife, Grant's children and the crew of his vessel, the Duncan, they head towards South America. Once underway they discover an unexpected passenger among them - Jacques Paganel, an esteemed geographer from France. 1. In the movie, the crew receives one of their clues about the possibility of Capt. Grant's location by way of having found the bottle in a mako shark. In the book, the bottle is found in a hammerhead shark. You probably wouldn't notice this slight change unless your four year old is an expert in identifying various forms of sea creatures in which case you would immediately hone in on the fact that a completely different type of shark is being mentioned. 2. In the book, the women-folk stay on board the ship as the men-folk explore South America. But you can't exactly leave Hayley on board the ship where she would miss all of the action now, can you!? 3. The end of the book is different from the movie but that's ok.
On the whole, I'm super-duper impressed with Disney for holding true to the spirit of Verne's original story. With only 98 minutes to tell the story, they managed to pack in quite a few of the adventures, most specifically relating to those that occurred in South America. The characters on screen match the personalities in the book and my favorite character both on screen and in the book is Monsieur Paganel. He is a riot either which way and Disney cast him well! "My dear Monsieur Paganel," said Lady Helena, you are letting your imagination run away with you, as usual. But the dream is very different from the reality. You are thinking of an imaginary Robinson's life, thrown on a picked island and treated like a spoiled child by nature. You only see the sunny side." I found this book to be a delightful read from beginning to end and I'm so glad I took the time to read it! One note: I purchased the In Search of the Castaways (Forgotten Books) edition of the book and have to say that the printing is very sloppy. Apparently there is a publisher who handles "forgotten books" and prints on demand. Paragraphs were frequently split, notations about removed illustrations were included and it was just a pretty tacky way to read the book. It certainly wasn't impossible, and it was economical! (Ha!) Since I ended up really enjoying the story and plan on sharing it with my own kids, I wish I had invested in a decent copy. But "why cry about bad weather? Enjoy it!" It's fun how our children's interests rub off on us. I now know that you are a bit of a shark expert and will turn to you when in need! This sounds delightful...in book and movie. Oh...and weird about the economical printing! Very intriguing... Never read this one, nor have I seen the Disney version. This is one of our "old favorites" with Haley Mills, too! I'm excited to find the book and read it to my kids! Love Haley Mills. I don't remember this movie though I'm sure I've seen it. The book sounds really fun. I haven't read this one, although I vaguely recall the movie from my childhood. I noticed that Verne uses a few characters from The Mysterious Island: Captain Grant and Aryton - who is a significant character in that book. After your notes about the printing, I am inclined to read this on my Kindle, from Gutenberg.